Some areas do not have significant climatic differences among seasons while others suffer from severe temperature variations. 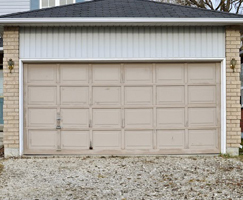 In any case, garage doors are exposed to the natural environment and the temperatures in the garage can affect the insulation of the entire house. Installing air-conditioners in the garage is not wise unless you spend too much time in there and you can actually improve the conditions indoors by taking care of the mechanism ensuring both your security and the protection of your home from the weather conditions. You must check the insulation efficiency of the door and improve it if it's inadequate. You must also replace the bottom seal in order to ensure that elements won't be entering underneath the door. The good functioning of the garage door springs depends on their flexibility, condition and pressure and low temperatures may affect them. You need to lubricate them properly and the specialists at garage door repair Lake Park would also suggest special lubricants, which will protect them from freezing. Keep the panel clean as well as the surrounding area. You don't want concentrated snow to block the movement of the door or moisture penetrating the material. During very low temperatures, you must open the door several times during the day to avoid the gathering of ice at the entrance. If the panel needs to be cleaned and painted, summer is the best season because it is not windy and the door can dry faster under the hot sun. It is also necessary to clean well the garage and throw away stuff that fill the atmosphere with dust. You don't want to spend time in a contaminated environment. It is the perfect time to prepare the mechanism for the winter. Hence, you must do thorough garage door maintenance to check the needs of your system. Insulation is important for the summer, too. So, check the walls for holes and moisture and make the necessary garage door repairs.